Very Low Supply – Dropping Prices … what’s wrong with this picture? As the ARMLS Market Watch report for Q3-2018 illustrates, the number of Maricopa County homes sold was greater than the total number of homes listed for sale at the start of the quarter … 20,938 verses 16,413 … the “months of supply” at the current sales rate is less than “3” … 2.4 is indicated in the KEY METRICS section. Historically this statistic would reflect a VERY tight market … heavily favoring sellers. 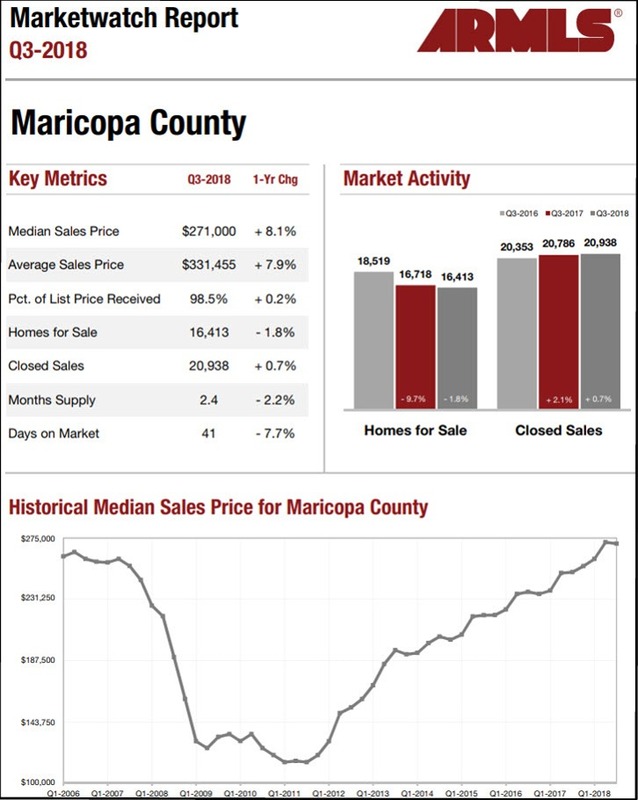 Also … the 16,718 homes for sale in Maricopa County shown in the chart for Q3-2017 was the first time that number had been under 17,000 in more than 30 years. The listing inventory went back over 17,000 early this year, but has since declined to the lowest level in “modern times”. But as reported in the ARMLS market report for October – STAT, the week starting October 21 saw a greater number of home listings price drops than in any week over the last three years. So “the market” is forcing price drops in the face of an all-time low “supply” in terms of both the actual number of listings as well as relative to the number of sales. Obviously, there are more factors involved here than just “supply and demand”. A strong hint at what’s going on … as also indicated in the ARMLS Market Watch Report Q3-2018 for Maricopa County, the sales-price to list-price ratio was 98.5%, and increasing. Historically, this has been in the range of 94 to 96% … historically sellers have yielded more in price negotiations. Thus, many current sellers are reducing list prices to get offers but “hanging tough” in negotiations. Sellers with over-priced listings are not getting offers, or are not budging on the price … so are not getting their property sold. Fortunately for successful sellers, as also indicated in the Market Watch report, the prices they are able to get are averaging 8% higher than a year ago … a huge price increase for housing. Average days-on-market for sold listings was 41, also a very low number. These statistics reflect a very informed market, both buyers and sellers, but buyers are now forcing the price issue despite having limited choices in the market. Why? Most likely buyers are being forced to be price-selective because of the big increase in both home prices and interest rates. According to Ellie Mae, the average FHA loan rate has increase from 4.22 to 4.95% over the last year. Combined with the price increase, the typical monthly loan payment is going to be more than $100 higher, putting the debt-to-income ratio for many above the qualifying limit … buyers have to be price-selective, else they just can’t buy. Bottom line: the overall economic environment is imposing a lid on the housing market.